In our house there is only one way to celebrate a birthday and that is, predictably, with afternoon tea. 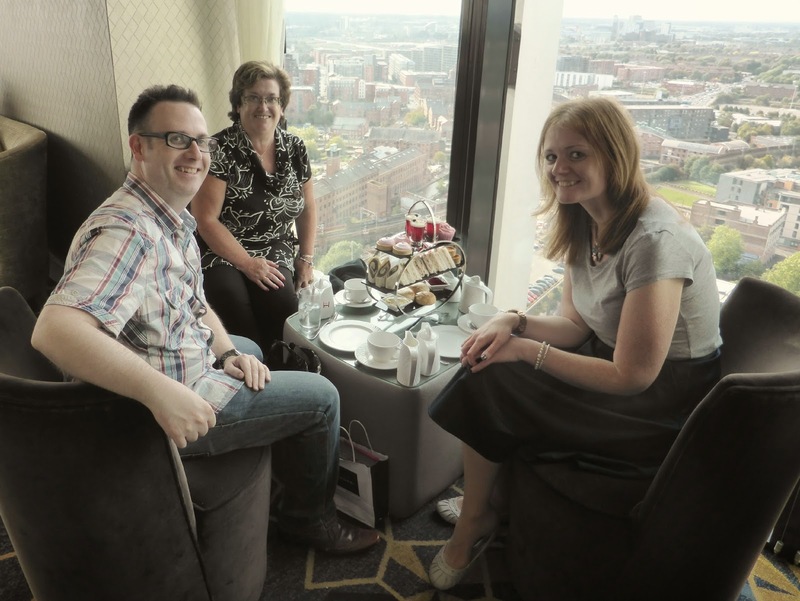 We recently went to Manchester for the day to surprise Simon's Mum with the Coronation Street Studio Tour and after all the exhausting drama on the cobbles we were in definite need of a good sit down and some fancy cakes. 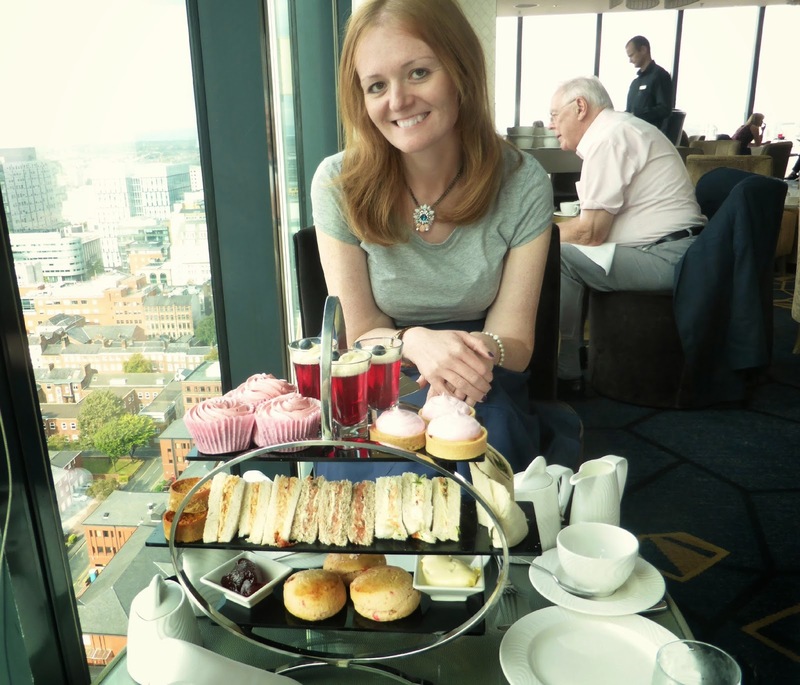 It's not always easy to pick out somewhere to go in a city where you don't live but I immediately remembered going to a gorgeous bar many years ago for a cocktail, so after a little research I was really thrilled to see that they served afternoon tea. 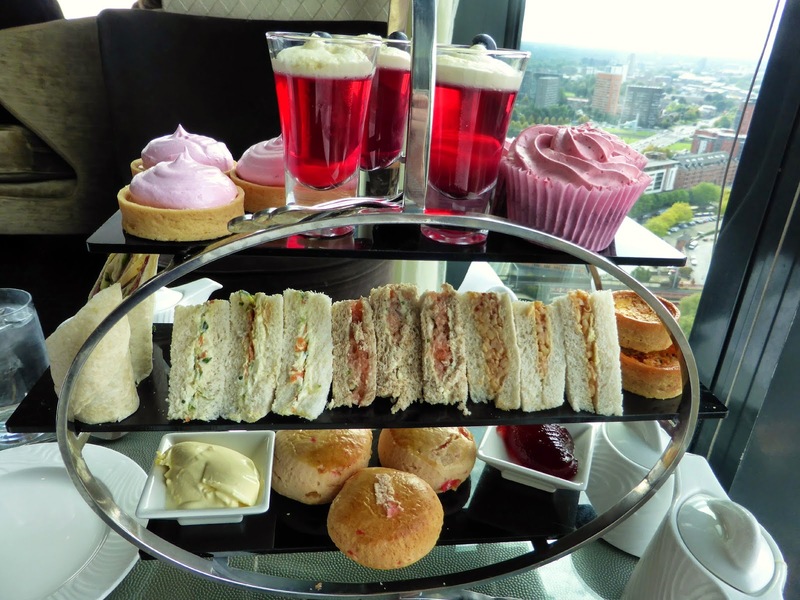 Cloud 23 sits at the very top of the Hilton Hotel and is accessed by its own special lift in the hotel lobby. We loved being whizzed straight up to the 23rd floor and stepping out of the lift to be greeted by elegant surroundings. The bar is decked out in creams and golds, has high marble tables and bar stools for cocktails and plush sofas for afternoon tea. 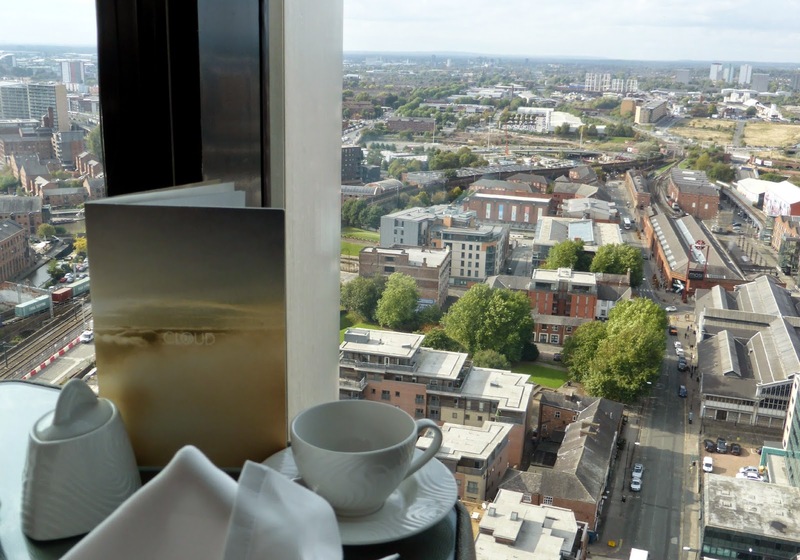 We were very lucky and bagged ourselves a table by one of the floor to ceiling windows looking out across Manchester and beyond to Salford where Simon grew up. Sitting down I noticed immediately how cold it was with the air conditioning blowing out freezing air. Luckily our wonderful attentive and friendly waiter promised to sort out the temperature for us and true to his word within 5 minutes I was able to sit comfortably in short sleeves. 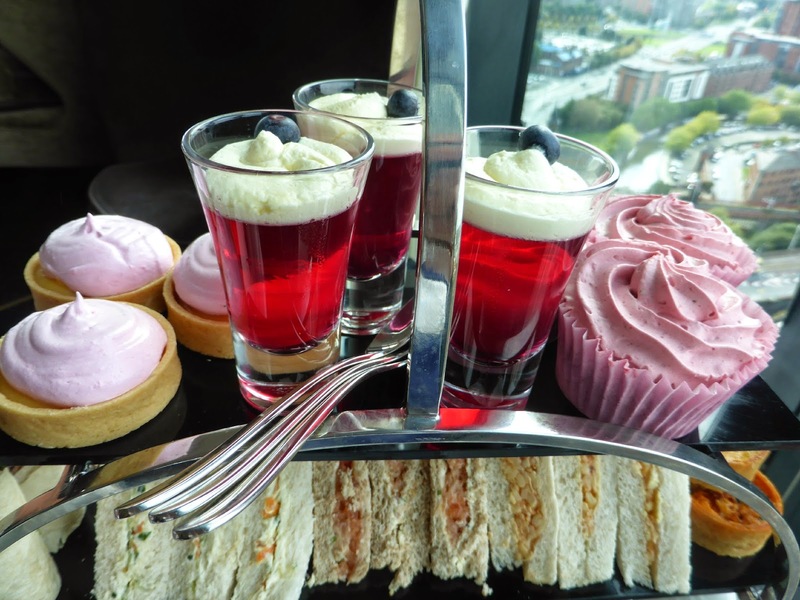 We all opted for Traditional Afternoon Tea, which during October and November has gone pink in support of Break Through Breast Cancer. As always we started with the savouries where we had a generous four sandwiches each as well as mini tomato quiches. I always love it when something different appears on the savoury tier and the quiches were a very welcome addition. Another change to the traditional was the cherry scones. We had a scone each and it was disappointingly small and flat compared to other monsters that we've had in the past. It tasted great though and Simon's Mum was very quick to comment on how fresh it was. After a little pause and a quick stroll round Bar 23 to admire the "sheer drop" view from one of the glass panes built into the floor we were ready to tackle the cake tier. I really loved how everything was pink, it made the cake stand look really fun. It's always great to have something that's a bit different. We started with the lemon tarts that were topped with pink meringue. They were beautiful, the lemon was very sharp but was complimented perfectly with the sweet tasting meringue. Next we went for something a bit lighter and picked up the raspberry jelly. It was good to have something that wasn't stodgy. The jelly was really sweet and fruity. To finish we had red velvet cupcakes topped with a generous swirl of bright pink icing. I love cupcakes and they are very welcome on my cake stand. 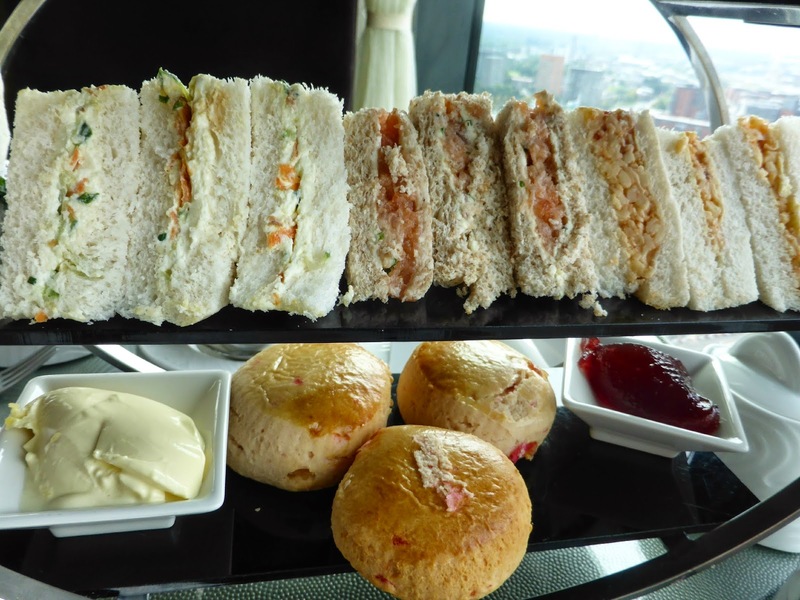 We were really impressed with the quality of the afternoon tea and level of service at Cloud 23. Our tea was constantly refreshed and we were really looked after and made to feel special. 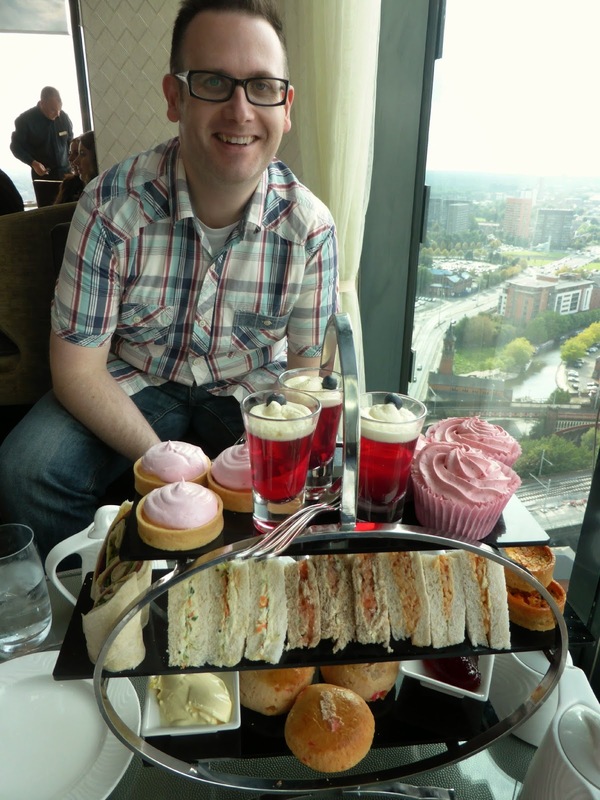 If you are ever in Manchester, definitely make sure you head up to the Cloud for a truly indulgent afternoon tea.